How would you explain or classify the armchairs? Well, they might simply be the wooden chairs with some luxury and huge armrests. And as far the need of armchairs is concerned I think there’s no place in this entire universe which can be complete without some proper furnishing arrangements and especially some comfortable chairs. 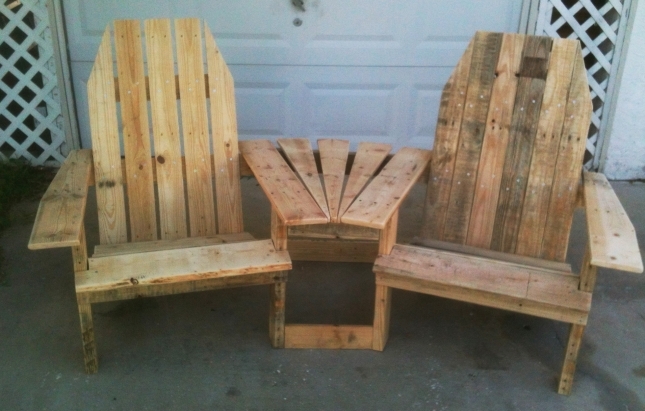 So being a major component of furniture items, we are presenting here in this article, some of the best armchairs from repurposed pallets wood. 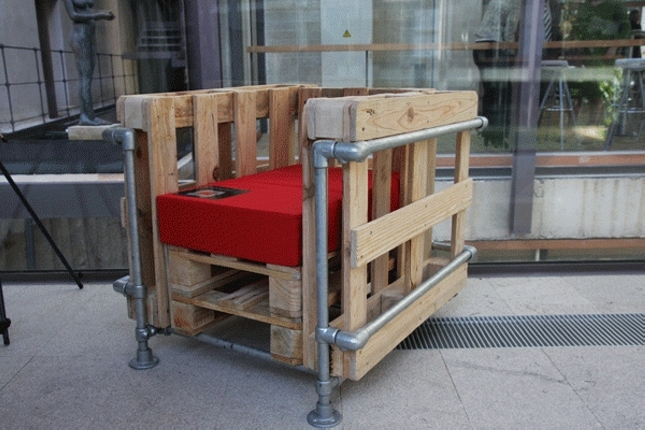 They would differ in the appearance but the main material would remain the same, these very wooden shipping pallets. 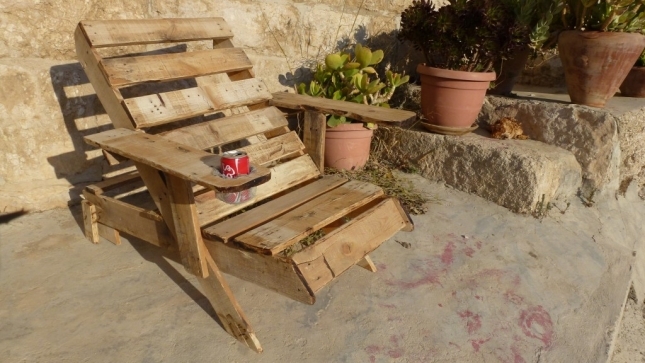 This is a vintage wood pallet outdoor armchair. 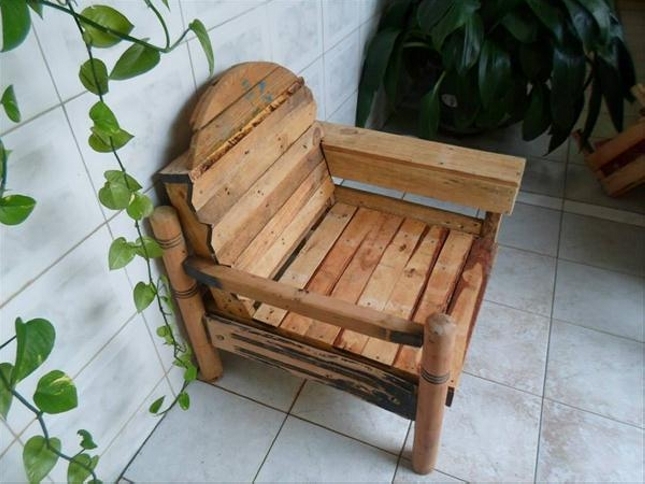 Made with most deteriorated pallet planks, some debarked wooden pieces are used for making the armrests which are obviously different from pallet planks. 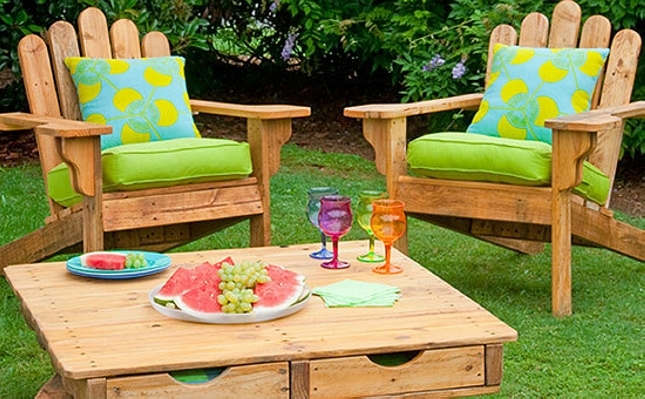 A great outdoor furniture item that can endure the extreme weather conditions for some longer periods. Dark green color has added some wild look to the armchair. 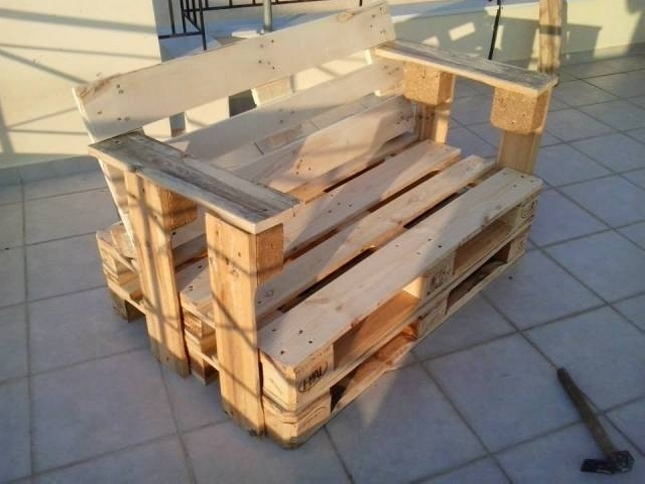 Here comes a classic wooden pallet armchair more like a huge wooden couch. What we did here actually, we disassembled afresh wood pallet, and using the cut to size straight pallet planks we assembled a basic frame of this pallet wood armchair. And equipped it with some additional storage space on both sides. 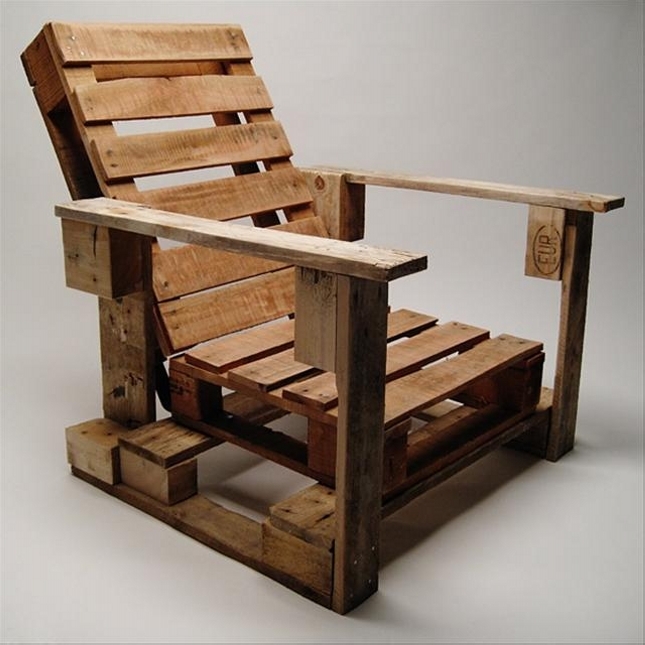 This is another armchair made with repurposed pallets wood. 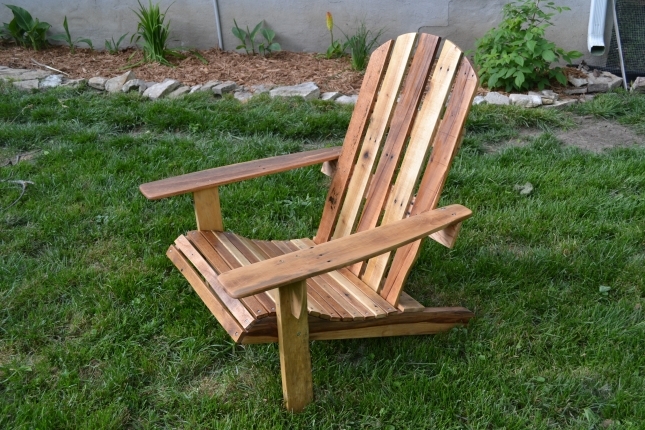 Again the same pallet wood planks gained by disassembling the pallets are used in making the basic frame of this armchair. A thin mattress sheet is fixed to the seat, while some mattress patches cut to size are fixed on armrests. And there is also an additional side table attached to the same armchair. 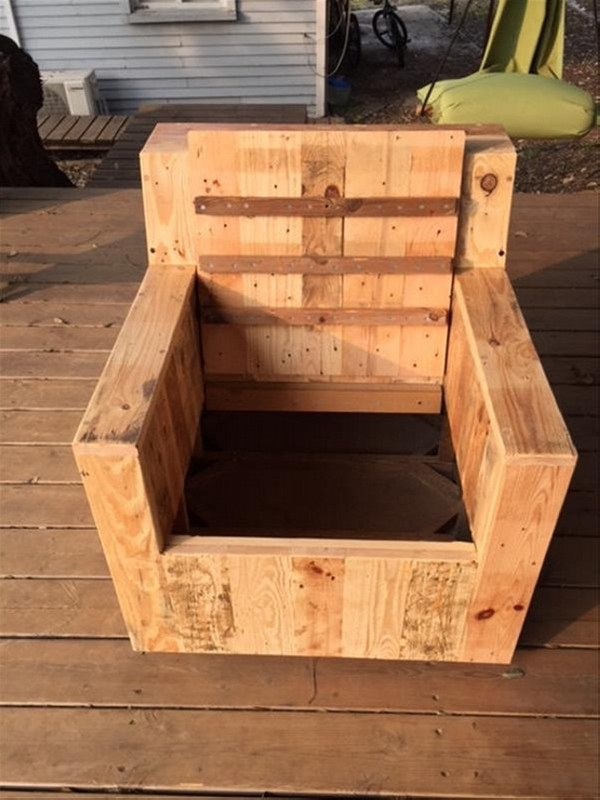 This kind of wooden couches are so much trendy now days. People are switching to this shape from the conventional large sofas and couches. It has got sufficient sitting space along with ultra luxurious armrests. 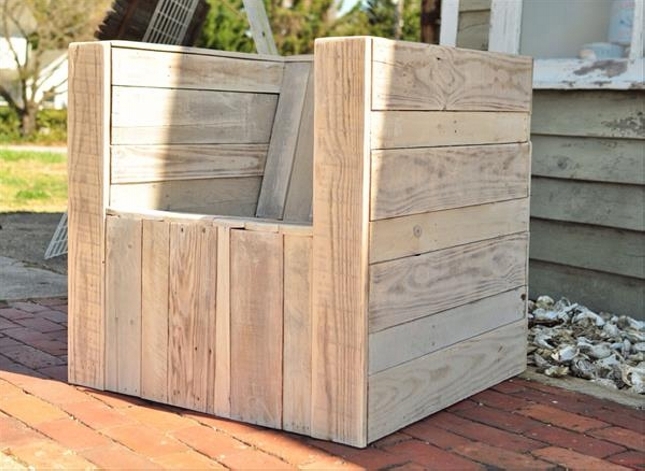 When you are the carpenter and have full control over the design specifications then you usually come up with such insane vintage wood pallet creations. This vintage wood pallet chair having circular legs and different armrests on both sides. If you have a green landscape or patio, you would certainly love to sit there and enjoy the weather conditions. So to sit and enjoy there you need some sophisticated wooden furniture item. 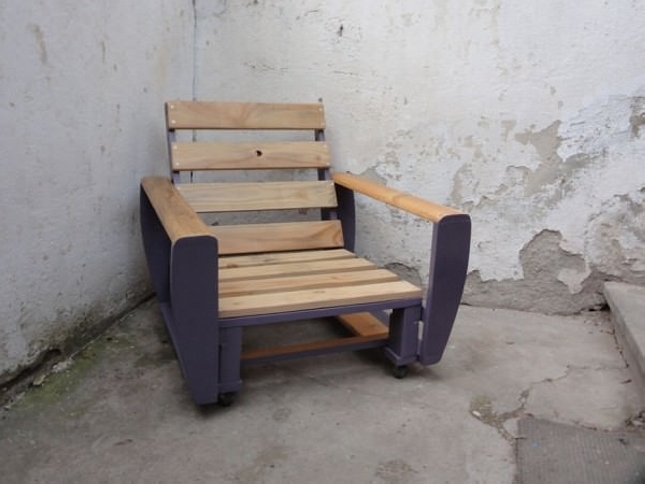 And this is the very appropriate armchair for your outdoor space that you would love to sit on. We have already presented an armchair similar to this one, the basic difference between these two similar armchairs is the design and the pattern on the back. Rest of the structure is same as the earlier one. 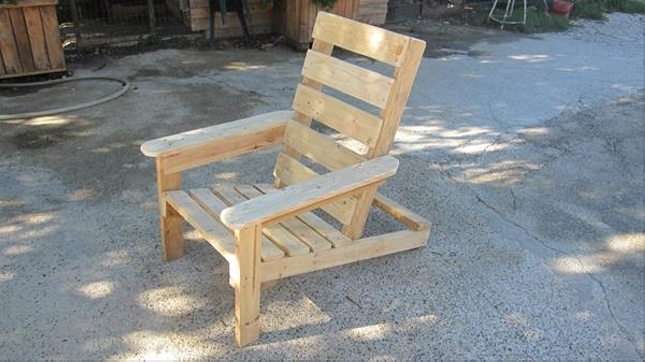 Despite of being unstained this is a perfect outdoor armchair that you can use anywhere in your patio or garden. 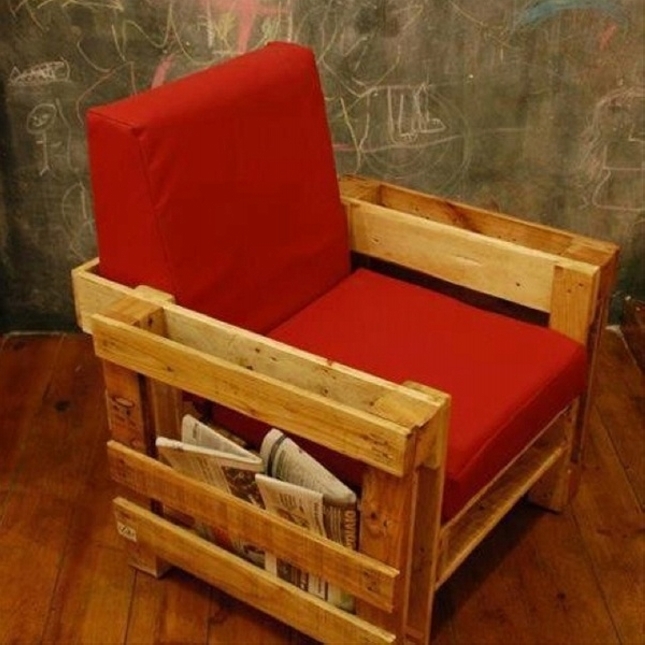 Well, what would you opine about this industrial wood pallet repurposed armchair? Initially this might look like some nutty or insane idea, but as we go in the detailed look. This is an ultra luxurious armchair embellished with red mattress which is contrasting to the rustic appearance of wooden pallet armchair. The time has passed when we were compelled to go to the market to buy some of the most expensive wooden furniture items as we were having no other choice. Just look at this adorable pair of armchairs, in none of the ways they are any lesser than their market based counterparts. 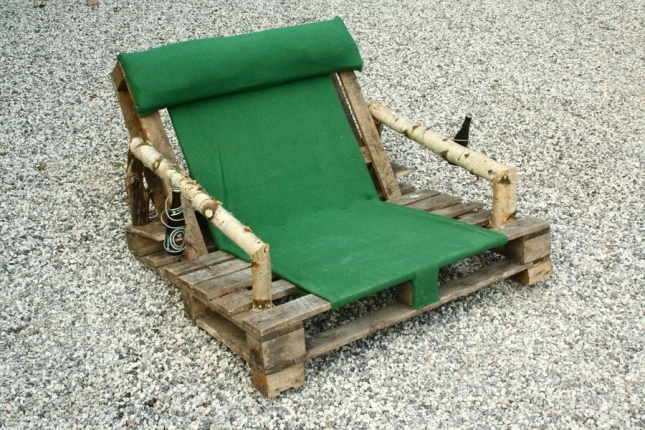 This sort of easy wooden pallet chairs are so damn trendy in Asia and far eastern countries lying on the beach. This could best be used on a beach or near the swimming pool. 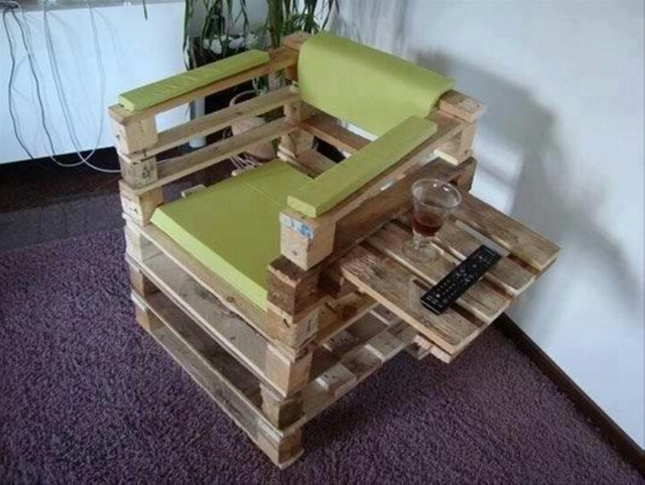 Try making this stylish wood shipping pallet armchair for your domestic use.